In January this year, Manan Wani of Kupwara, a Ph.D scholar studying in Aligarh Muslim University, gave up studies and joined the Hizbul Mujahideen. SRINAGAR/NEW DELHI : In January this year, Manan Wani of Kupwara, a Ph.D scholar studying in Aligarh Muslim University, gave up studies and joined the Hizbul Mujahideen. Manan reportedly gave a statement that he felt there was “dignity in fighting Indian forces.”Later in May, Mohammad Rafi Bhat of Ganderbal district, an Assistant Professor at the University of Kashmir, joined the Hizb. But a day later he was gunned down in an encounter. In September, a photograph of MBA graduate Haroon Abbas Wani of Doda, holding an AK-47 rifle and sporting an ammunition pouch, went viral on social media. Haroon, who worked in a pharmaceutical company, announced he had joined the Hizb. Haroon, Bhat and Manan are not among the rare cases of educated youth giving up a bright future and picking up the gun. Rather, more such youth are taking up the gun than those less educated. An analysis by The Sunday Standard of data of the Jammu and Kashmir Police and the Institute of Conflict management in New Delhi shows that this trend began after the killing of 21-year-old Hizb commander Burhan Wani in July 2016.According to the data, for five years between 2011 and 2015, only 14 youth who were graduates or more had joined the militant ranks. But there has been sharp spike since then. In 2016 alone, 37 graduates joined militancy and in 2017 the figure jumped to 49. 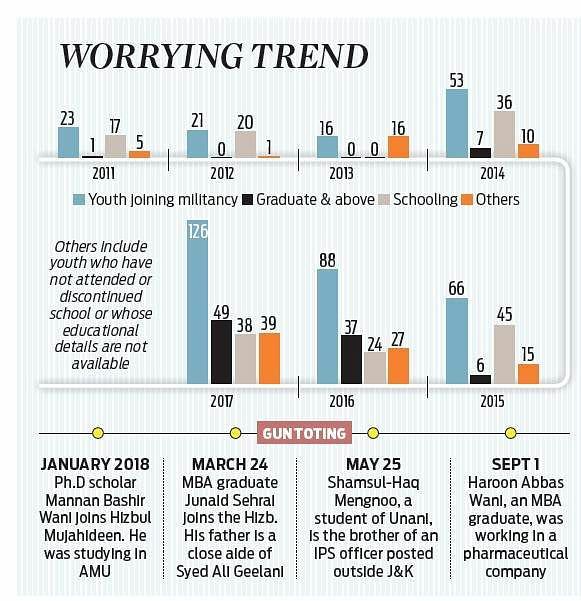 Official figures for this year are not yet available but many educated youth have turned militants so far.More worrying for the authorities is that the educated youth outnumber those who have studied only up to school or are dropouts. Academician and legal expert, Dr Sheikh Showket of the Central University of Kashmir, said more and more educated youth were joining militancy because of the government’s “muscular policy” and the use of brute force to quell peaceful agitations. “Street protests took place in Kashmir in 2008, 2009 and 2010. The youth expected that Delhi would respond to their peaceful struggle in like manner but instead, brute force was used to deal with them,” he said. This sowed the seeds of extreme anger among the people and it erupted when Burhan was killed. A muscular policy, as opposed to the healing touch, is founded on the strategy of an eye for an eye, a bullet for a bullet, a stone for a stone. The Bharatiya Janata Party is a strong advocate of such a policy but many aver that it only alienates the people further. “Militancy has become a craze and with each passing day youngsters are joining militancy. They want to resolve the Kashmir issue through the gun,” Showket added.Analyst Gowhar Geelani agreed with him. “Kashmir has a young population which is educated. They have less fear and get visibility through social media. They feel that the street protests were not dealt with a human face but with extreme and brute force so they see the gun as an option to challenge the state’s writ despite knowing that death is ahead,” he said. Academician and Kashmir civil society member, Prof Hamida Nayeem, said Burhan’s killing provided the trigger for the youth to turn to militancy. “The lava was already there and it was waiting to explode. Burhan’s killing proved to be the trigger,” she said. Zahoor Ahmad, a youth from Pulwama in south Kashmir, said the state was pushing the youth towards the gun. “When a youth comes out on the road to protest peacefully, he has to face bullets, pellets and tear gas shells. The youth feel that instead of getting maimed or killed by pellets and bullets during protests, it is better to take up the gun and fight before being killed,” he said. 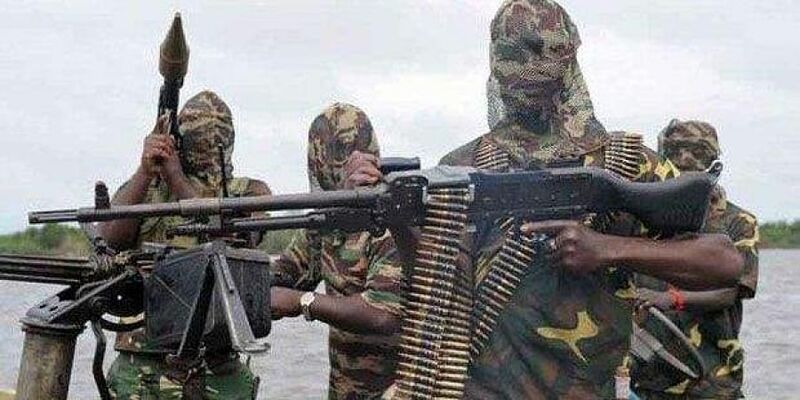 Ajit Kumar Singh, a researcher at the Institute of Conflict Management, said militant organisations have always been on the lookout for educated youth to join their ranks so this trend does not surprise him. “If you see the militant propaganda, they make emotional appeals to further their cause and with Burhan Wani’s death, they found a face to further their agenda. The numbers speak for themselves,” he said. Arif Hussain Malik, a researcher in Kashmir University, said “more than his life, Burhan’s funeral was the thing that attracted more educated youth towards militancy.” “He became sort of a rock star in the Valley. If you compare the numbers before and after 2016 it will show you a clear picture. His death was the catalyst,” Malik said. Lt Gen DS Hooda (Retd), the former Northern Army commander, linked the frustration to the formation of a coalition government between the People’s Democratic Party and the BJP. “If we see the recruitment pattern, the trend (of educated youth joining militancy) actually started in 2014. This had to do with the political dispensation which came in the state,” he said.